​All the bucket attachments for the 150 mini loaders are the same as the ones for the 100 mini skid steers. 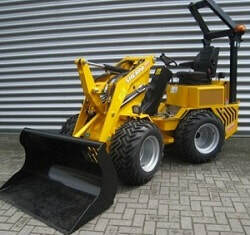 To find out more visit our mini skid steer bucket webpage. The mini loader buckets with hardox knife are designed for transporting and levelling sand surfaces and other materials. These mini loader bucket attachments include inlay plate and quick fastener. The mini loader closed buckets are specially suited for transporting sand and other materials and for levelling surfaces. This mini loader bucket is perfect for breaking open many different materials. Made from sturdy construction, the pin bucket will tackle hard materials with ease. 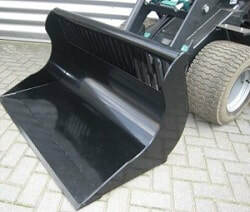 It can rake, pinch tiles and do work on roads and other surfaces.